Marziah Karch lives in Portland, Oregon and is the author of multiple books and magazine articles. Bylines include Lifewire, Rodale's Organic Life, Tech Republic, WIRED, and GlitterSquid. She's currently a doctoral candidate researching the information behavior of independent game designers. There is absolutely nothing wrong with painting it pink, if it gets more girls to play. There will probably be plenty of girls for which this is not an issue, but the EV3 Home Edition is definitely positioning itself as a very boy-oriented toy, and it doesn’t seem to be drawing the same level of scorn that Lego did for introducing a line of obviously girl-oriented toys. The EV3 has stickers that make it look like a beat-up battle-bot, an infrared sensor that looks like slitted snake eyes, and accessories that look like swords. The color scheme is an aggressive red, black, and white. The core building instructions (missions) are for robot snakes, tanks, and scorpions (although I have to give mad props to the bonus bot El3ctric Guitar, which is just rock-and-roll cool). In general, the EV3 really couldn’t look more like something that belongs in the boy aisle if they covered it in camo. I’m not saying that this is some sort of conspiracy to exclude girls, but there’s no reason we shouldn’t try to make it her toy as much as it is his. I know a few things about being a girl who bucks the odds and goes into tech, but I don’t always remember what it’s like to be a middle schooler. Luckily, I have a consultant on that part: my 12-year-old daughter. She thought the key to making the EV3 more appealing to girls was in both the appearance and missions. Let’s talk about appearance first. Yes, it’s very superficial, but it still matters. I know it’s super tempting to just paint everything pink and call it a girl thing. It’s what the consumer electronics industry has been doing for years. Acoustic Research just launched an AR for Her line, and when I attended the press release they made fun of the “paint it pink” movement and then proceeded to introduce products that were … painted pink. Oy. That said, adult women balk at the idea because we’re adults and don’t want to be treated like children. This really is a trick that can work for some middle school girls. I once bribed my daughter to help me review Python for Kids with a pink squishy keyboard and a Raspberry Pi. (Haha, tricked you into learning Python.) 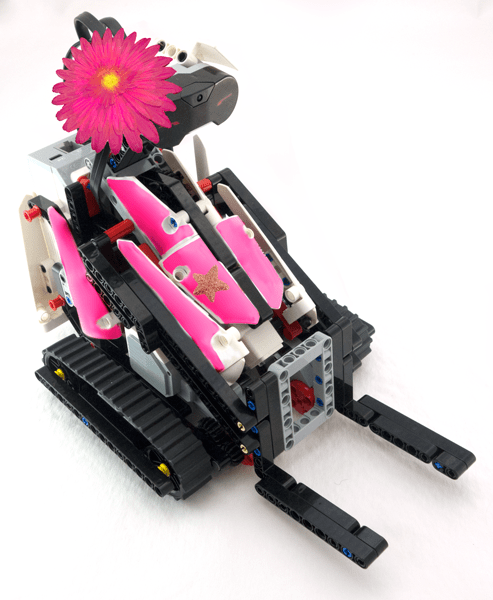 I’m not suggesting that the EV3 needs a Lego Friends edition or even necessarily to be pink. I’m suggesting that girls should know right away that they don’t have to keep the EV3 looking like the picture on the box. It can be pink. It can be steampunk. It can have flowers. It’s your toy, not your brother’s. Make it look like your toy. You can use spray paint, nail polish, or permanent marker to repaint and modify the EV3 stickers before applying them to your EV3 if you wish. You could just use your own stickers, too. They don’t need to be the stickers that came with the set. Electrical tape is also fantastic for temporary color changes that can be removed or repositioned. You can also repaint your EV3 in whatever colors you wish — with adult supervision and some spray paint. I recommend getting a Lego that isn’t part of your EV3 and using it as a test first. Better to ruin something you don’t care about if it turns out your paint isn’t compatible. Parts you can recolor include beams, beam frames, the white flat “wing” or car part panels, the swords, the “blades,” and the bionicle eyes. Do not spray anything on servos, sensors, cords, tires, gears, or the Intelligent Brick. Keep those parts well away from any spray paint. Use “Krylon for Plastic” spray paint or a similar brand meant specifically for plastic. That way you can avoid primer and reduce the number of layers you need. Spray in a well-ventilated area, such as outside. Go in very thin layers. Allow to dry between layers. Turn the parts after they dry, so you get all angles. You can also use model enamel to paint Lego, but again, avoid the servos, sensors, and Intelligent Brick. Once the EV3 was released and the community started building, it wasn’t all scorpions launching balls at bug-shaped remotes. The community has made some awesome builds, and there some great missions in the bonus bots. I mentioned the El3ctric Guitar build, which is an official EV3 bonus mission, but there’s also the fantastic Braille printer, the Braigo, which was created by Shubham Banerjee from a clever modification of the Plott3r. 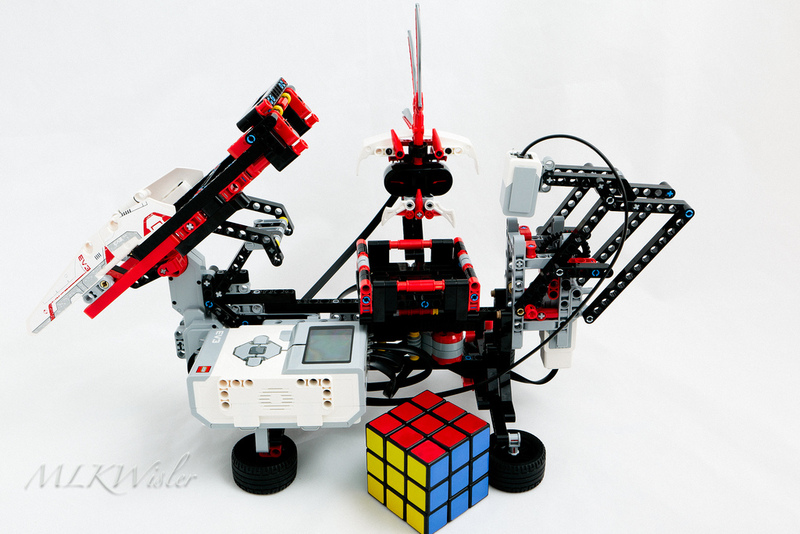 The Mindcub3r uses an EV3 to solve a Rubic’s Cube puzzle. Here’s an example that my friend Melissa Wisler assembled from available online instructions. Anika Vuurzoon has made some fantastic builds with various Technic and Mindstorms sets, most of which are available on YouTube, including a flying Lego whirligig, a Monopoly assistant, and a gramophone player that used the color sensor to read color blocks from the bottom of the spinning records. Most videos show a brief opening animation with female Lego minifigs or Barbie. Not only are these fun missions in their own right, they’re made all the more powerful for girls by providing a female role model. Some of her builds involve engineering tasks and some involve both engineering and programming, so there’s a lot of inspiration there for builders of all levels. If you’re focusing on a group of students of any gender, the Lego Education set is a great choice. It costs a bit more, but the Lego Education core set with the Lego Education core expansion (I wouldn’t get one without the other) is a very gender-neutral set. More colors, no stickers. The models are mostly animals like elephants and puppies, and the curriculum designed to go with this set is also very inclusive. I actually had a Lego Education rep apologize that one of the characters was called Gyro Boy instead of a more gender-neutral name. He needn’t have apologized. Gyro Boy is flat-out awesome, and “Gyro Person” just doesn’t have the same ring. The Lego Education set has to be ordered directly from Lego Education and comes in its own box (two boxes if you get the expansion) and can be programmed using the same EV3 Home Edition software you can download for free. (You can also use the $99 Lego Education software that includes data logging and expandable curriculum modules.) Some of the parts are different between the two sets, such as an included gyro sensor but no ball shooter, a sonic sensor instead of an infrared sensor, and a ball castor for a frictionless third wheel. I’m a big fan of the Educator Vehicle, since it’s just an efficient little castor bot that can take all sorts of attachments and be programmed to do all sorts of things. It’s a simple way to approach beginning robotics tasks, no matter what your gender, and it’s a pretty common approach. You can start with beginning tasks like line following and wall crawling and move on to other missions, like harvesting flowers from a vase or playing remote-control soccer. Maybe the robot can play music from your tween’s favorite band when the color sensor detects a certain color. Be sure to take your cues from your audience. There’s nothing wrong with spider robots that hunt minifig targets, and there’s nothing wrong with kitten robots that play with virtual balls of yarn. Just as I wouldn’t want to presume a middle-school-aged girl must behave according to gender stereotype, I’m also not going to force her to behave contrary to it. The best way to get girls involved with the EV3 is to give them lots of options and then ask them what they want to do.